So; what is the process to load an image here onto the Forum from Slickpics? Don't know about slik pic? I think I tried it,and at the time couldn't figure it out either. Someone on here suggested Imgur. I have been having good luck using that for a host. Rob, the overall process is about the same as photobucket. I havn't done a whole lot with it other than post, but I found once I got somewhat familiar with it, it's really easy, and very fast to upload and post. I still have my PB accounts, and it's downright unbearable to view them with it's slow speed and unending pop-ups. Basically if you create an account, just spend a bit of time exploring and figuring things out. 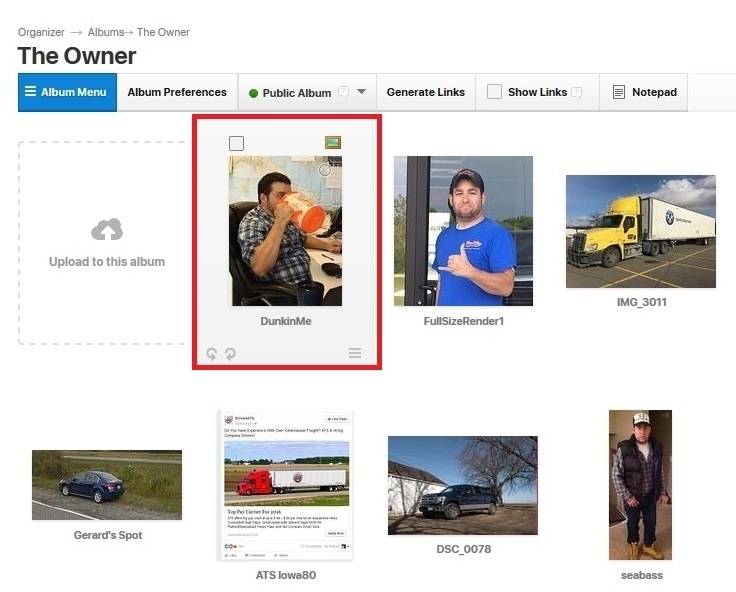 There is an "organizer" where you can create folders and upload, and once you have photos up you can select them and generate a forum code. 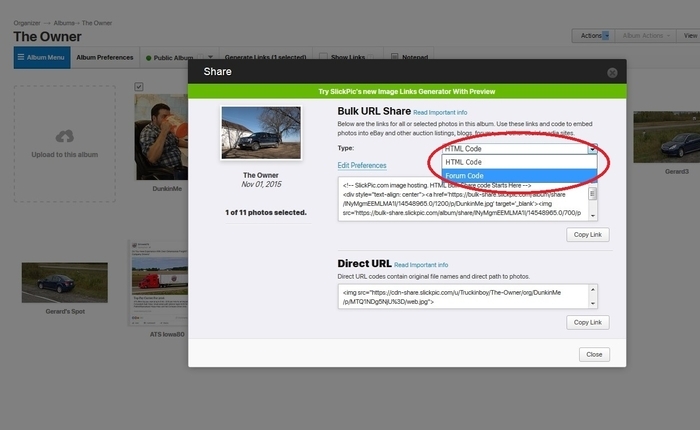 One nice feature is that you can select multiple images and create the batch of codes in one click. 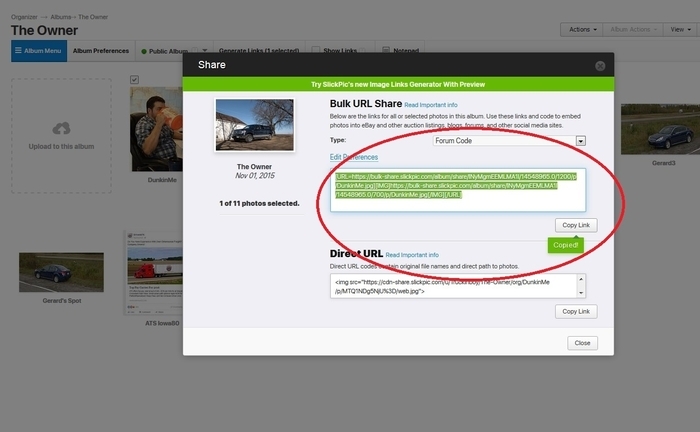 This is my process to upload photos on here from SlickPic. When you are on your SlickPic page, logged in with full access to your photos, make sure you are in Dashboard view. 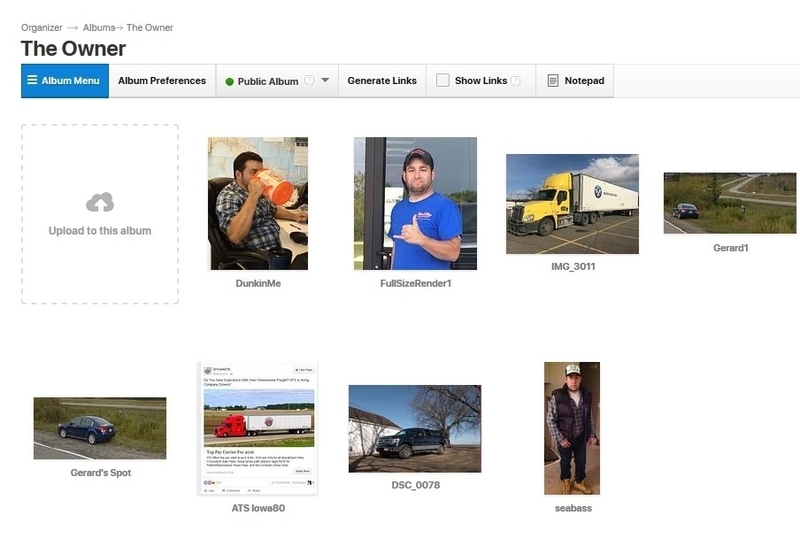 Click into the album you want to select pictures from. At the top of each thumbnail photo, if you hover over the photo, the area around the photo Grays (hard to tell from my photo but it does) and there is a little open box that appears in the top left corner of that photo. 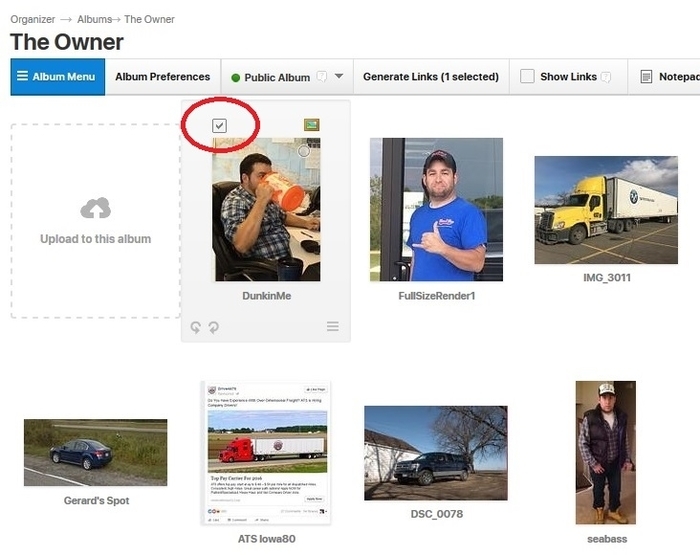 Once you have the photos you want to share check boxed, up in the upper right hand area, click Actions, a dropdown will appear....click Share Selected Photos. SlickPic will then generate links. There is HTML version links and Forum code links...I always pick Forum Code. Once you've clicked the dropdown for Forum Code, you can click Copy Link. I probably have some form of OCD, and I always manually right mouse click and Copy rather than using the Copy Button, but its one in the same. Once you have it copied...you can go to the Post Reply section of the Forum and just do a Paste. No extra button clicking is needed. I'll look at it when I have some time. So far, I go to the picture and using windows get the "address", paste that into the forum window and then type in the img and backslash img manually. Your's looks like the correct way. Rob, are the shots you've posted the last few days from a SlickPic account? One of these days I need to upgrade to a paid account to get rid of the text. Do you actually type in the "img" text? If you highlight your pic address in the forum box and then click the first icon in the second row ("insert image") it will bracket the address automatically. When I was trying to load it through Slickpic nothing was showing up. So, I tried it copying the image address and then showing the img codes myself and no Slickpic ad appeared. It's obviously not the correct way to do things and rather clumsy. I'm more or less just feeling my way through.